Amateur astronomers using a 40-year-old telescope and a homemade CCD camera have detected the faint afterglow from a gamma-ray burst billions of light years away. March 14, 2000 -- On March 4, 2000, a small band of amateur astronomers using a 40-year-old telescope and a home-built CCD camera succeeded in something that few professionals even try. They detected the faint afterglow of a distant gamma-ray burst -- one of the most powerful explosions in the cosmos. "This is very exciting news and shows the power of dedicated, competent amateur astronomers," said NASA/Marshall's Jerry Fishman, principal investigator for the Burst and Transient Source Experiment (BATSE) aboard the Compton Gamma-Ray Observatory. 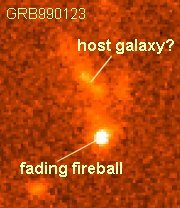 Right: Nestled 7 arc seconds from a 17th magnitude foreground star, the 20th magnitude afterglow of GRB 000301C is circled in this CCD image from the US Naval Observatory 1m telescope in Flagstaff, AZ. Credit: Arne Henden.The optical afterglow was first detected by the Nordic Optical Telescope in La Palma, Spain. Gamma-ray detectors on the NEAR and Ulysses spacecraft first recorded the burst, labeled GRB000301C, on March 1, 2000. Initially, the sky coordinates of the burst were not well known. "The error annulus from NEAR and Ulysses was a strip about 4.2 arcminutes wide and 180 degrees in length" says Kevin Hurley of UC Berkeley's Space Science Lab, home of the Interplanetary Gamma-ray Burst Timing Network. "Then we got a second position from the Rossi Timing X-ray Explorer. Their error annulus was 4.2 degrees long and 8.7 arcminutes wide. By combining the two we narrowed it down to a 50 arcminute square error box." That was just what astronomers needed. The burst was conveniently located near the constellation Hercules, which is high in the night sky and easily seen from northern latitudes this time of year. Bill Aquino and a group of other amateur astronomers with the Buffalo Astronomical Association decided that they would try to detect an optical afterglow from the explosion. "Arne Henden [a professional astronomer] posted an alert message to the American Association of Variable Star Observers (AAVSO) discussion forum about this burst," says Aquino. "Arne had detected it with a U.S. Naval Observatory telescope and it was fading more slowly than other afterglows. We knew it was out there and just about within our reach at 20th magnitude." Along with collaborators, Frank Chalupka, Dennis Hohman and Tom Bakowski, Aquino -- a new AAVSO member -- pointed the astronomy club's 12-inch reflecting telescope at the nominal coordinates of the burst and accumulated data for two hours. Later when the images were calibrated and summed, there it was, a 20th-magnitude fireball just 7 arc seconds from a much brighter 17th-magnitude foreground star. "I know other amateurs have been prepared to image one of these fields, but Aquino's group was the first to have good enough weather and enough gumption to go after one," says Arne Henden, a Senior Research Astronomer with the USNO Flagstaff Station. Henden posted the alert for amateurs at the American Association of Variable Star Observers' internet message board and helped Aquino's group reduce their data. Theorists think studying gamma-ray bursts (GRBs) at optical and radio wavelengths might help unravel one of the biggest mysteries in modern astronomy: what causes these powerful gamma-ray explosions? Since the Hubble Space Telescope detected the first optical counterpart of a gamma-ray burst in 1997, astronomers like Henden have vigorously pursued the faint afterglows using some of the most powerful telescopes including Hubble, Keck, and Palomar. The problem, says Henden, is that the transients fade very rapidly. They're usually dimmer than 20th magnitude just a few hours after the onset of the explosion. Plus, when Earth-orbiting satellites first detect a gamma-ray burst, its coordinates usually aren't well determined for hours or days. These two factors combine to make photographing the optical afterglows a challenge even for the biggest telescopes. The first inkling that amateurs might be able to catch these elusive "optical transients" came in January 1999 when a University of Michigan robotic telescope slewed to the location of a burst just a few seconds after it started. What the telescope saw stunned most astronomers. The optical light from the GRB was 8.9th magnitude -- visible in a good pair of binoculars if anyone had been looking. The detection was made possible thanks to a rapid localization of the burst by the Italian-Dutch BeppoSAX satellite. The coordinates were transmitted electronically to the telescope via the Gamma-ray Burst Coordinates Network (GCN), operated by Scott Barthelmy at the NASA/Goddard Space Flight Center. Now, thanks to the efforts of NASA and the American Association of Variable Star Observers skilled amateurs around the world are going to be plugged into the GCN, too. "We're working on a program to instantly notify amateur astronomers that a gamma-ray burst has taken place," says Janet Mattei, director of the AAVSO. "As soon as the AAVSO receives email from Goddard that a burst has been detected, we will page participants with the coordinates and also distribute that information by email." "If anyone is interested and they have a telescope and a CCD camera they can participate. The more the merrier!" Mattei and NASA/Marshall's Jerry Fishman also have organized an unusual meeting in Huntsville, Alabama next month -- the High-Energy Astrophysics (HEA) Workshop for Amateur Astronomers. Unlike previous HEA get-togethers, this one is targeted exclusively at amateurs. A group of expert research scientists in the field will deliver two full days of lectures and demonstrations on April 13-14 intended to acquaint participants with the basics of high-energy astronomy so that the participants themselves can disseminate this information to students and the public. The amateur gamma-ray burst network will be an important topic of discussion. Dr. Chryssa Kouveliotou, director of the Universities Space Research Association, working at NASA's Marshall Space Flight Center first suggested the involvement of amateurs in gamma-ray burst research during a visit by her and her late husband (Dr. Jan van Paradijs) with Janet Mattei two years ago. Both Kouveliotou and Jerry Fishman think that a global network of amateurs can make an important contribution to the science of gamma-ray astronomy. Big research-level telescopes like Hubble are heavily oversubscribed for observing time. They can't always turn to look at GRBs soon enough to catch the fading optical fireball. Amateurs could fill in the gap and help define the first-ever complete light curves of gamma-ray bursts. "We're planning to be there," says AAVSO member Bill Aquino, who will travel to the HEA workshop along with other members of the Buffalo astronomy club. "This first detection [of GRB000301C] was just a dry run for us. It had already been imaged by professionals when we saw it. Now we have to tune up our telescope and get ready for a solo discovery." Mattei and Fishman hope to have the full amateur-GRB network up and operating by the time of the meeting. But, says Mattei, if you can't attend the meeting, you can still sign up for the network at the AAVSO website. "It is exciting to do real-time astronomy instead of the more systematic, time-consuming science projects that we usually do," concluded Arne Henden. With the advent of the GRB network there could be plenty of excitement in store for dedicated amateurs like Aquino everywhere. Sign-up for the AAVSO Gamma-ray Burst Network -- although this page says there is a Dec. 1, 1999 deadline, you can still register!